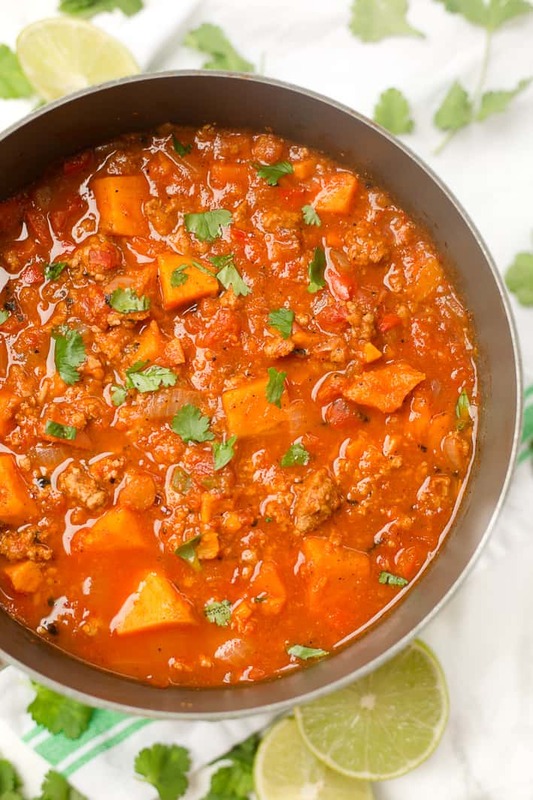 This Paleo sweet potato chili is an easy hearty meal that just so happens to fit into a Paleo lifestyle or a Whole30 program! When I started typing up this post, I realized it might be a little funny that my last soup recipe was vegan and this chili is Paleo, even though I’m personally not vegan or Paleo. I mostly label recipes as such to make it easier for people who do follow those types of eating styles to find them. I eat a bit of everything! 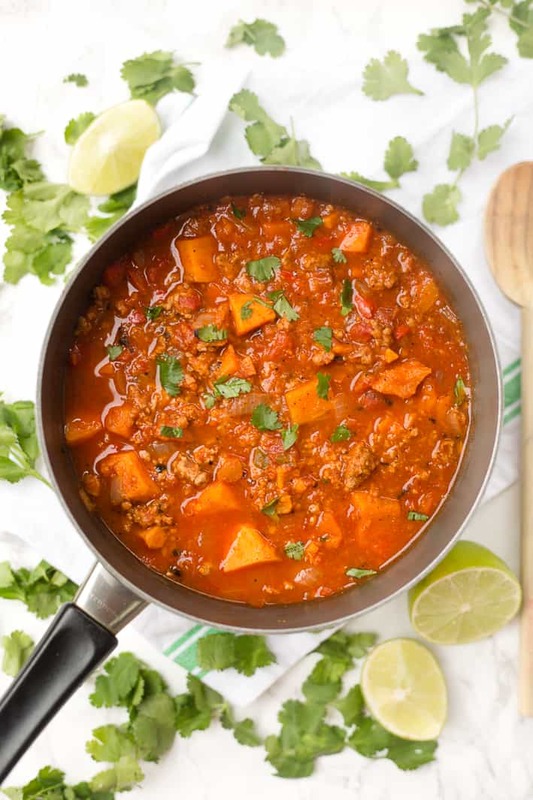 So, while this chili does happen to be Paleo and Whole30-approved, it’s friendly for all types of eaters and especially perfect for any sweet potato lovers. So, what makes this chili Paleo (and Whole30 approved), exactly? Mostly just the fact that it doesn’t have beans since those are a no-go for a strict Paleo or Whole30 eater. Between the ground turkey and sweet potato cubes, it’s so hearty that you don’t miss them! 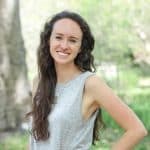 I did a little research to see if I could figure out the difference between Whole30 and Paleo since both programs focus on eating whole foods and eliminating grains, dairy, and legumes like peanuts and beans. One of the major differences is that Whole30 is meant to be a 30 day eating plan, while Paleo is a lifestyle. Also, Paleo eaters often recreate their favorite sweets using unrefined ingredients like almond flour and honey, while Whole30 bans honey, pure maple syrup, etc. and advises against making “healthified” treats. But if you don’t care about all of the above, the main takeaway is that this is a great chili to make if you’re looking to try a bean-free chili recipe or if you just happen to be out of them! Of course, like most chili recipes, this is easily adaptable. 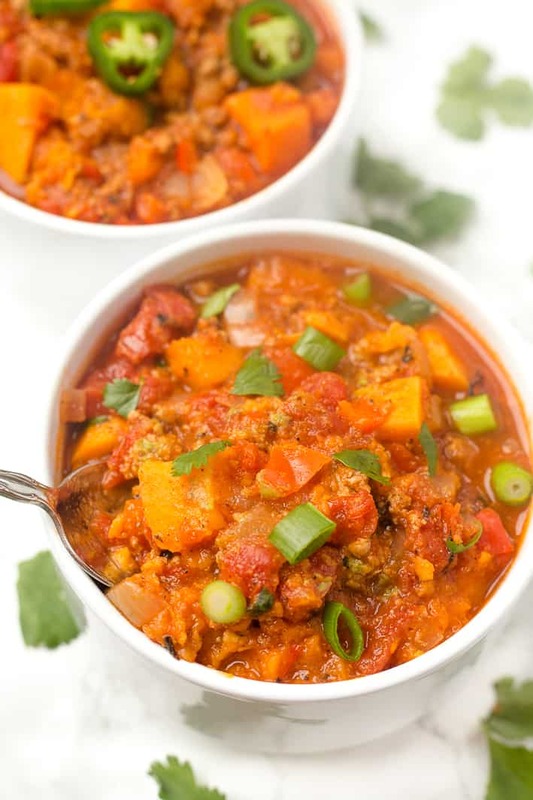 I’m actually planning to make this Paleo sweet potato chili again today! I already had most of the ingredients on hand, and I picked up some ground turkey yesterday, as well as chili powder and ground cumin from the Whole Foods bulk spices section since I didn’t have those in my dorm room. I counted this as 8 ingredients (I didn’t include water or salt and pepper), so it’s super simple. I hope you get a chance to make it soon, too! If you make this Paleo sweet potato chili, feel free to let me know in a comment or take a picture and tag me @livbane on Instagram. I’d love to see! 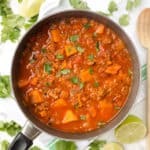 This Paleo sweet potato chili is an, easy hearty meal that just so happens to fit into a Paleo lifestyle or a Whole30 program! Heat a medium pot over medium-low heat. Add oil, diced onion, bell pepper, and ground turkey, and stir every few minutes. Cook for 6-8 minutes, or until meat is cooked through. While turkey and vegetables are cooking, peel sweet potato and chop into roughly equal-size cubes. Add sweet potato cubes, crushed tomatoes, water, chili powder, cumin, garlic powder, salt, and pepper to the pot. Turn heat to high and bring to a boil. Then, reduce heat to a medium-low simmer and cook for 20-30 minutes, until sweet potatoes are soft. Run a potato masher through the soup roughly to help thicken it up. Serve with diced green onions and/or avocado on top! Why have I never put sweet potato in chili?!? I need to make this! Sweet potatoes take chili to a whole new level! I just bought the needed ingredients and will try it. It looks easy. WHAT?! I’m in shock! 🙂 I hope you love this chili! And if you’re looking for other sweet potato ideas, I love roasting them like this! This was absolutely delicious! Loved it so much, I’ve shared it with a couple of friends. 🙂 I made it in the Instant Pot (see note below). I used regular old crushed tomatoes as I couldn’t find fire roasted crushed tomatoes. I also used organic ground chicken breasts and a 20 oz container of organic cubed sweet potatoes. I also added some cayenne to make it a little spicy. I’ll most definitely be making this again. It’s great for my school week lunches. **Note: Instant Pot- I used 1 lb of ground chicken, added one 15 oz can of petite diced tomatoes with their liquid and adjusted the broth to 2C. Cook on HIGH for 5 minutes then QR and turn off IP. The sweet potatoes were plenty cooked and will continue to become more tender due to cook over time . Since I added more liquid to accommodate IP cooking (diced tomatoes + broth), I added 1 cup of frozen riced cauliflower to thicken it up once cooked. It was perfect!!! Super easy and delicious. My kids loved it so that’s always a WIN! My sweet potatoes always go bad, but now I hav no excuse not to use them! I’m so glad your kids love this chili, Adrienne!